The Dragonoid Colossus is unique wherein the whole thing opens up as one after putting together all Battle Gears on the Transformation Hub. They will remain closed until you drop the closed core Dragonoid Bakugan into the center of the hub. Dragonoid Colossus was released in October 2010. It's a combination of four Battle Gear and a Bakugan, like the Maxus Bakugan from New Vestroia. 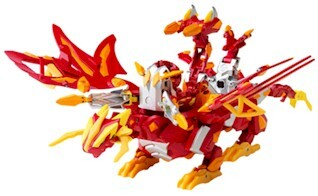 Purchase Dragonoid Colossus Bakugan from Amazon now!